The series of single-phase hopper loaders VLM allows conveying plastic granules to processing machines, drying hoppers and dosing units. 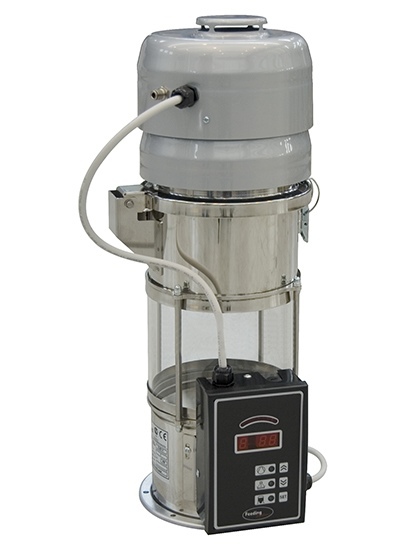 Single-phase hopper loaders are equipped with a built- in suction unit. 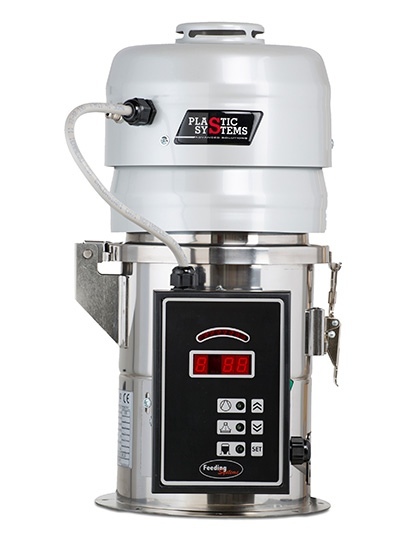 Suction capacity up to 600 Kg/h of material, at a distance of 30 m.
A microprocessor board and a keypad allow the operator to easily program and control the machine. • 900 W double-stage blower (model VLM25 equipped with a 1800 W brushless blower). • Automatic filter cleaning with compressed air. • Inspection door with a stainless steel filter for venting. • Control with a keyboard, and a digital display showing operating status and alarms. • A built-in double cover divides the motor from the blower guaranteeing a better operation. • Aluminium fixing ring for a 360° installation. • Suction probe and pipe included. • Proportional valve PVN with percentage setting. • Pyrex mini-hoppers for direct installations on machines.